Rachel Von | The Journal Gazette The Mad Ants' Rob Gray goes to the basket against Santa Cruz's Deyonta Davis during Sunday's game at Memorial Coliseum. Rachel Von | The Journal Gazette Stephan Hicks become just the second Mad Ants player with 700 career field goals on Sunday. The Mad Ants tried a several remedies for their doldrums Sunday. There were unusual lineup combinations, shots hoisted from every which angle and even an awesome moment after the first quarter in which Davon Reed grabbed the public address announcer's microphone and asked the Memorial Coliseum fans to get pumped up to help ignite the team. 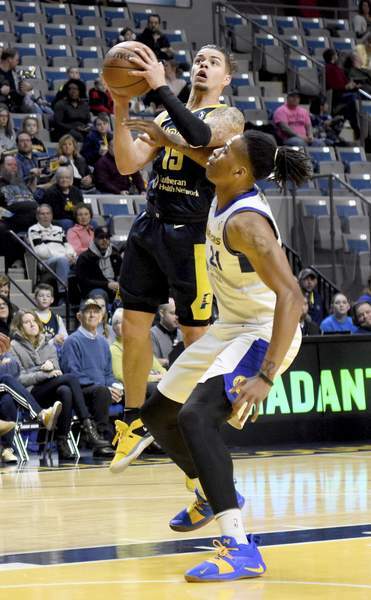 The Mad Ants, down 11 points then, got close to overcoming the G League-leading Santa Cruz Warriors, but Fort Wayne wound up with a 114-104 loss in front of 3,805 fans, some of whom brought their dogs for Hoops and Hounds night. Deyonta Davis paced Santa Cruz (26-10) with 26 points and 13 rebounds. 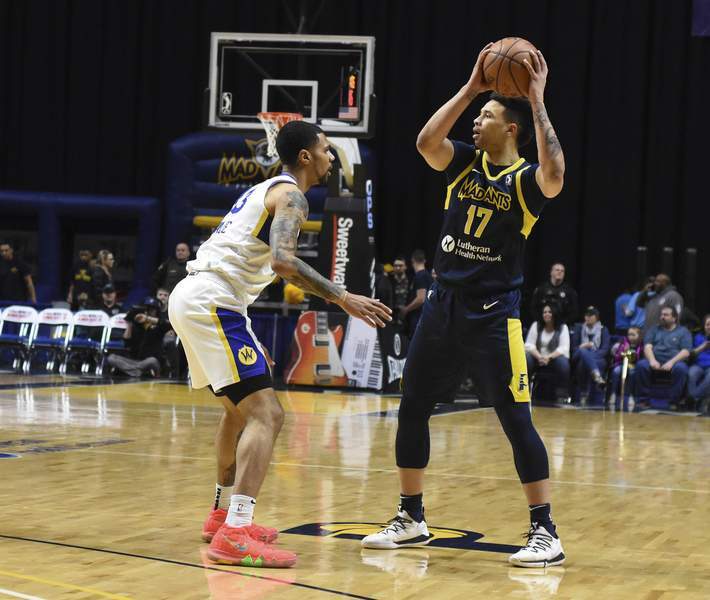 Kendrick Nunn aded 25 points and Damion Lee's 23 points and 11 rebounds, as the Warriors shot 51.6 percent and outrebounded Fort Wayne 53-44. Rookie Rob Gray, who had 23 points, six assists, four rebounds and five turnovers, led Fort Wayne, but his team shot only 40.4 percent as it lost its second consecutive game on the heels of winning 4 of 5. The Mad Ants waived guard Tra-Deon Hollins on Wednesday – he was second in the league in assists (8.4) and steals (2.6) – after sources, including his agent Bill Neff, confirmed he'd failed multiple drug tests for marijuana. On Thursday, the Mad Ants lost center Ike Anigbogu when the parent Indiana Pacers released him to facilitate an NBA trade. The losses could be felt at both ends of the court Sunday and things got worse when Pacers rookie Alize Johnson took himself out in the fourth quarter with an undisclosed injury, after he'd totaled five points and 11 rebounds. “I asked him in the locker room if he was all right and he said, 'Yeah, I'm good.' So we'll see,” said Gansey, though it's unclear if the injury was from a player landing on Johnson's knee. Hicks had 16 points and 10 rebounds for the Mad Ants. Reed had 16 points, nine rebounds and seven assists. Omari Johnson added 15 points. “I look at our assist-to-turnover ratio and 22 assists to 18 turnovers is not really what I was looking for,” Gansey said. Things don't get easier now for the Mad Ants, who play 7 p.m. Wednesday in Lakeland, Florida, against the Eastern Conference-leading Magic (23-12). “We've beaten a bunch of the top teams in the league already, but we've just got to find our edge,” said Hicks, who became the second player in franchise history to eclipse 700 field goals, joining only Ron Howard (1,532).